Roots Only - An easy solution to at home colouring! | Sahrish Adeel - Malaysia based Pakistani Beauty & Lifestyle Blogger! Roots Only - An easy solution to at home colouring! Hair colouring was never easy until I found Roots Only. Can you guess its abilities by its name? I am always into experimenting my hair and this time I was working on something that involved 'full head colour change at home'. 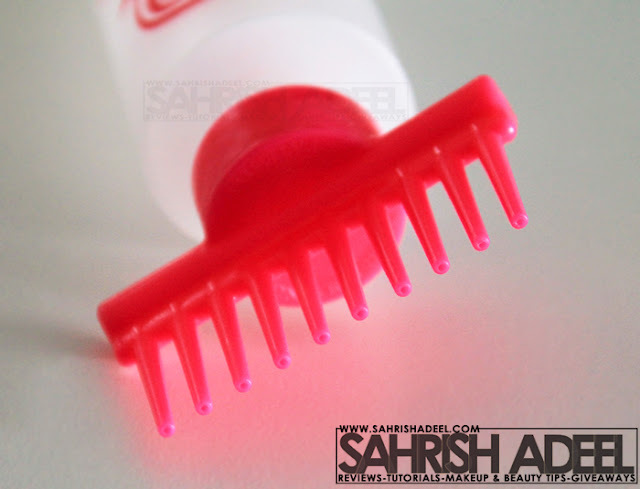 =P This product has helped me alot with the colouring, specially at the back of my head was always a problem. Perfectly applies colour to the roots. Takes about 5 minutes to cover roots of whole head. Works with all hair types/lengths. Hair sectioning is not required. Almost transparent bottle makes it easy to mix colours in proper ratios. Has a measuring scale over it. I use it for colouring as well as for oiling my hair. I found it extremely helpful for oiling purpose as well. Everyone who colours as home or oil hair and have no extra hand to help should buy this. It is a one time expense and its not really expensive. Best thing is, its reusable. People who have grey hair and needs to colour just the roots after 2-3 weeks should definitely get this as it will be the most helpful thing you can find. $5.99 for Single Pack, $10.99 for Double Pack & $15.99 for Triple Pack. You can buy this product from Roots Only's Website Here! or Join the on Facebook Here! I hope you have liked this post. Let me know how do you dye your hair or apply oil at home? Disclaimer: PR sample, however all the views are my own and honest.